Faced with tougher European regulations on pollution, but a constant desire among affluent drivers for speed and panache, many carmakers have reached the same solution: luxury hybrids. Pricy new models are heading for production from BMW, Daimler AG's Mercedes-Benz and Tata Group's Land Rover, among others, - some with gasoline engines, some with diesels, but all with electric motors and battery packs. While they may not have as much of an impact on energy consumption and clean air as smaller, more efficient hybrids and pure electric cars such as the BMW i3 and the Renault Zoe, the new high-performance hybrids could represent a clever compromise between the demands of regulators and speed junkies. The cars offer a "feel-good factor" to wealthy drivers, according to LMC Automotive analyst Jonathon Poskitt, giving them the social kudos of being "green" while also allowing them to still enjoy the buzz and status of a fast, powerful vehicle. On top of existing rules aimed at cutting carbon dioxide emissions for all new cars in the European Union by 2015, the 28-country bloc is working on stricter targets for 2020. That makes luxury hybrids of critical importance for premium carmakers. "Manufacturers need to gently push them into the market, and doing this under the premise that it provides politically correct performance - in other words, green - is a nice way to market that," said Tom De Vleesschauwer, director of long-term planning and sustainability for consulting firm IHS Automotive. But there are also risks. Carmakers will need to convince drivers that hybrid engines perform at least as well as the traditional gasoline and petrol varieties. And they will still have to apply electrification to their larger luxury sedans and sports cars in order to meet the stricter emissions rules, De Vleesschauwer said. But he was optimistic. BMW's new i Series of electrified cars "symbolizes the new acceptable face of performance - keeping performance relevant for the times," he said. In addition to the BMW i8, the latest production-based performance hybrids on display at the Frankfurt auto show include the Mercedes-Benz S 500 Plug-In Hybrid and Land Rover's Range Rover Hybrid and Range Rover Sport Hybrid. 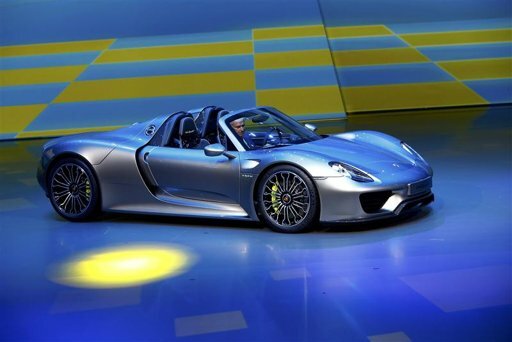 But performance-tuned hybrid propulsion systems won't be exclusive to high-end luxury vehicles. Among the performance hybrid concepts on the Frankfurt show floor are VW's Audi Sport Quattro, Geely Automobile's Volvo Concept Coupe and Toyota Motor Corp's Yaris Hybrid-R.
Toyota, whose Prius remains the world's best-selling gasoline-electric vehicle, describes the Yaris Hybrid-R as a "showcase of ideas for the development of hybrid technology for maximum performance and increased driving pleasure." While the standard Yaris is a modest hatchback aimed at entry-level buyers, the addition of all-wheel drive and a 420-horsepower powertrain inspired by the Toyota TS030 Hybrid Le Mans racecar injects some serious sizzle into the subcompact. Volvo's Concept Coupe is the first effort from new design boss Thomas Ingenlath and is the first to use Volvo's new scalable product architecture, which will underpin a whole family of future compact vehicles. The Concept Coupe's underlying architecture is flexible to accommodate completely autonomous driving - a goal that Volvo hopes to put on the road "before 2020." For now, the Frankfurt show car features a potent 400-horsepower hybrid powertrain. While it sports a plug-in hybrid driveline, the Audi Sport Quattro concept is all about pure performance. With nearly 700 horsepower on tap, the all-wheel-drive coupe features a twin-turbocharged 4.0-litre V8 gasoline engine with cylinder deactivation and a start-stop system to improve efficiency. On the production front, the new Mercedes-Benz S 500 Plug-In Hybrid is being prepared for an early 2014 introduction, when it will square off against such competitors as Porsche's recently launched Panamera S E-Hybrid. The S 500 combines a 329-horsepower turbocharged 3.0-litre V6 gasoline engine with a 107-horsepower electric motor. Also slated for delivery in early 2014 are the new Range Rover Hybrid and Range Rover Sport Hybrid, which British parent Land Rover, a unit of India's Tata Group, is billing as "the world's first premium diesel SUV hybrids." Both utility vehicles share a common drivetrain, built around the company's turbocharged 3.0-litre V6 diesel mated with an electric motor, producing a combined output of just under 340 horsepower. At the opposite end of the hybrid spectrum, in terms of size, shape, styling and sporting character, is BMW's i8, which has been seen previously in concept guise at various motor shows and debuts at Frankfurt in final production trim. Ian Robertson, BMW's global sales and marketing boss, puts the i8 in "in the super-sports category ... it's all that you'd expect from a performance car." Built on a lightweight chassis with a carbon-fiber passenger cell, the four-passenger coupe features futuristic styling to match its advanced technology. Under the skin is a hybrid propulsion system that marries a 129-horsepower electric motor at the front with a 228-horsepower turbocharged 1.5-litre three-cylinder gasoline engine in the rear. BMW plans a global launch of the i8 next May, initially targeting buyers in Europe, North America and China.